Today, approximately 60% (36,600 km2) of Svalbard’s landmass is covered by glaciers. This equates to a total volume of ice of approximately 7000 km3. The largest glaciers are situated on Edgeøya, Barentsøya and Nordaustlandet. Here the temperatures are somewhat lower than in Spitsbergen and evaporation from The Barents Sea allows for sufficient precipitation in the form of snow. It is the balance between summer temperature and winter precipitation that decides whether glaciers advance or retreat. Different types of glacier are found in Svalbard. 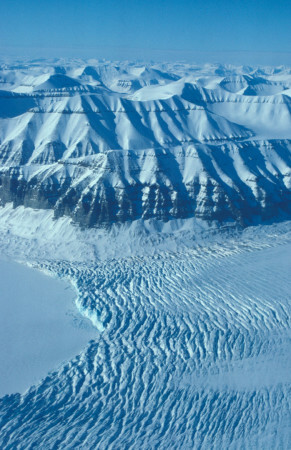 The largest glaciers are known as Ice Caps. These are found on the eastern islands. The largest Ice Cap is Austfonna on Nordaustlandet, which has a total area of 8120 km2 and a total volume of around 1900 km3. Austfonna and Vatnajökull on Iceland are the largest existing Ice Caps. It is only the much larger Ice Sheets on Greenland and in Antartica that exceed Austfonna and Vatnajökull in size. Spitsbergen is dominated by another type of glacier, the so-called Spitsbergen-Type Glacier. It consists of large connected areas of ice and is divided up into a large number of rivers of ice and glacial fronts by mountain ridges and nunataks. This type of glacier is particularly common in the south and north western parts of Spitsbergen. Many of the glaciers calve into the sea. In the central parts of Spitsbergen there are mainly found smaller glaciers that only fill parts of the valley landscape. These glaciers are called Valley Glaciers or Cirque Glaciers. Longyearbreen and Larsbreen near Longyearbyen are examples of Valley Glaciers. HOW OLD ARE THE GLACIERS? For the last 4000-5000 years Earth has been subjected to a marked cooling, which gradually has created better conditions for the growth of glaciers and permafrost. 5000 years ago the average temperature in Svalbard was around 4 degrees warmer than today. Then one would probably have to climb 200-400m up in the mountains in order to find permafrost, and many of today’s glaciers would not have existed. The largest glaciers would have existed in a much-reduced size. 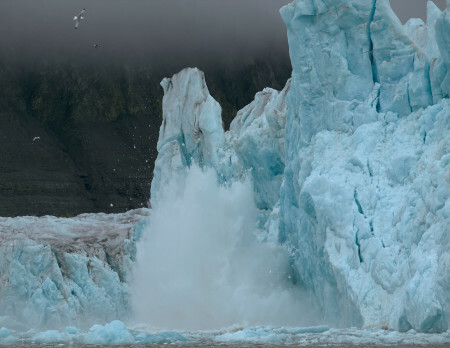 Many of Svalbard’s glaciers, therefore, are less than 3000-4000 years old. This climate development is the basis for a unique glacial landscape in Svalbard. If one goes 2km from Longyearbyen during winter it is possible to enter an ice-cave and come down to the underside of a glacier. This is an unusual experience. The ice-cave is special because in it there are found remains of plants, from the time when the glacier was formed. Dating reveals that these plants were covered in ice 1100 years ago. However, there hasn’t been continuous glacial growth for 1100 years, but periods, like today, where the glaciers have diminished in volume.